In a conversation at The Shinnyo Center, teachers and practitioners discussed the question: how can Buddhists serve young people who want spiritual fulfillment but shun traditional religion without compromising their sacred teachings? Greg Snyder speaks to the audience about power in Buddhist institutions. “Religious institutions have actually owned the sacred to control the secular. We have our own history of that, and still do.” Photo by Sam Littlefair. 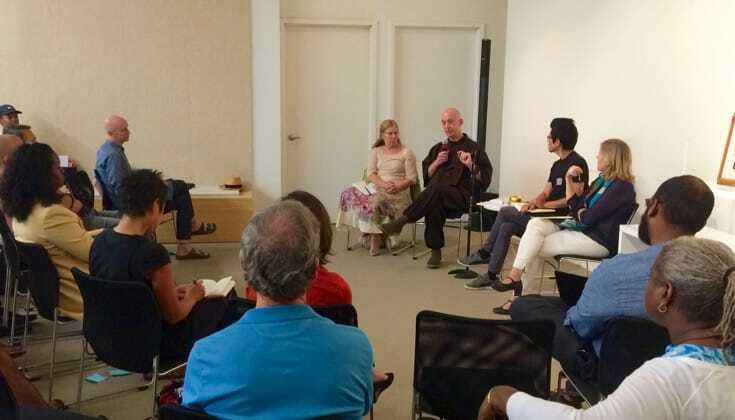 On Friday, contemplative teachers and practitioners in diverse traditions came together at The Shinnyo Center in midtown Manhattan to discuss the future of contemplative philosophy. The event was titled “Joining the Sacred and the Secular,” and was organized by GPIW and the Contemplative Alliance. Most of the discussion focused on a critical tension: young people are hungry for spiritual fulfillment, yet seem to eschew religion; how can contemplative communities serve secular spiritual seekers without compromising the sacred heart of their traditions? Attendees discussed the secularization of traditionally spiritual practices like mindfulness and yoga, and the spiritualization of technology and activism. Most of the discussions were led by Buddhist teachers representing the Tibetan, Shinnyo, Insight, Theravada, and Zen schools of Buddhism, however there were also teachers representing secular mindfulness and Ashtanga Yoga. In that spirit, much of the day’s conversation centered around the language and narratives that Buddhists, mindfulness teachers, and yoga teachers use to share their teachings with newcomers: Is mindfulness suggested as a tool for relaxation or liberation? Are teachings prescribed or offered openly? Do we see technology as an impediment, a gift, or a neutral tool? Most participants agreed that the sacred is secular, and so the question is not how to join the two, but how to appreciate their unity. 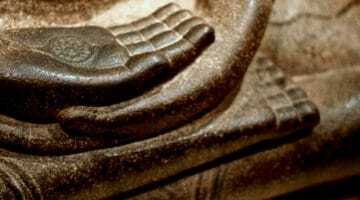 Theravada monk Bhante Suddhaso offered a different viewpoint, suggesting a definite delineation: the sacred is what leads us towards enlightenment, and the secular is that which does not. In that traditional sense, secular philosophies that offer worldly experiences as their end goal are harmful, for they may actually guide practitioners away from enlightenment. Vajrayana Buddhist teacher Lama Rod Owens discussed how spiritual teachings can be co-opted to harmful ends. Ashtanga Yoga teacher Eddie Stern corroborated this viewpoint, saying that he feels many yoga teachers can have a negative impact by not respecting their tradition. Many teachers agreed that in order to truly be of benefit to one’s students, one must be sensitive, open, and properly trained. Part of that might mean adjusting what language a teacher uses based on what will resonate with their students, which could even mean adapting religious language to secular language. The conversation also covered the role of technology. “I think young people are going to have to teach us how to be mindful of technology,” noted Morey. Morey leads teen retreats, during which the participants don’t have access to their phones. She, like many other members of the discussion, noted that people seem to be happy when they are less distracted by their phones. Matt Weiner, the dean of religious life at Princeton and a Buddhist practitioner, said that the busier you are the less loving you are, and technology abets that busyness. The conversation ended with a discussion of activism and the responsibility of contemplative institutions to engage with secular and social issues. Presenters discussed the importance of heart, open-mindedness, training, and human connection for continuing contemplative traditions. One idea seemed to be agreed upon: that there is a hunger among young people for contemplative teachings, and contemplative teachers will have to bring everything they have to bear to meet both the spiritual and secular needs of modern society. 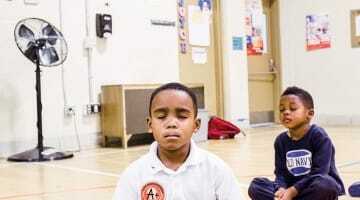 Forum: What Does Mindfulness Mean for Buddhism?